The Pentax Q10 isn't much bigger than a credit card, but does the tiny sensor mean it's destined to be any more than a toy? We have a lot of time for a compact system camera (CSC) promising DSLR quality that is properly compact. On the latter point the second-gen Pentax Q10 delivers, building on the original Pentax Q from 2011 (the world's smallest CSC) and being barely larger than a credit card in height and width, plus a mere thumb-width in depth. This ensures that, even with 5-15mm standard zoom attached, it will comfortably fit in a jacket pocket. Alternatively if unscrewing the Pentax Q-mount lens it will also slot easily into your jeans. We're big fans of the Q10's retro styling, complete with tactile top and front-mounted dials; the latter four-option 'Quick Dial' being used to select a range of options including digital filter effects. These include the attractive 'vintage colour' and cross-processed film looks; each working well in lending images a dynamic, eye-catching appearance, especially if the light isn't particularly favourable. While the carry-anywhere convenience of the Q10 is admittedly cool, given that you couldn't manage to achieve the same with practically any rival CSC (coming closest are the Canon EOS M or Nikon 1 J2), small camera proportions don't necessarily make for the best pictures. There's a reason why professional camera and lens set-ups are back breaking: namely bigger sensors and bigger glass on the front. So can the teeny Q10 actually compete with a DSLR proper? Headline specifications are an effective 12.4-megapixel resolution from a new back-illuminated 1/2.3-inch CMOS sensor - so not actually any physically bigger than that of the original 'Q' or most single lens snapshot cameras for that matter. This being a Pentax, we also get body integral sensor shift shake reduction (SR), improved auto focus speed over its 'Q' predecessor, a top light sensitivity of ISO6400 - modest by the standards of an actual DSLR - plus the increasingly popular High Dynamic Range (HDR) function. This produces a single composite from a series of several successively shot images to maintain detail in otherwise washed out highlights and blackened shadows. Furthermore Q10 users are offered 19 digital filter effects, with 11 selectable at the point of image capture, and the rest applicable in playback mode once the image has been shot and saved. As expected, Full HD 1920x1080 pixels video-capture also features, here at a smooth 30fps maximum frame rate. While the above hardly reads as ground breaking, the essentials are here. 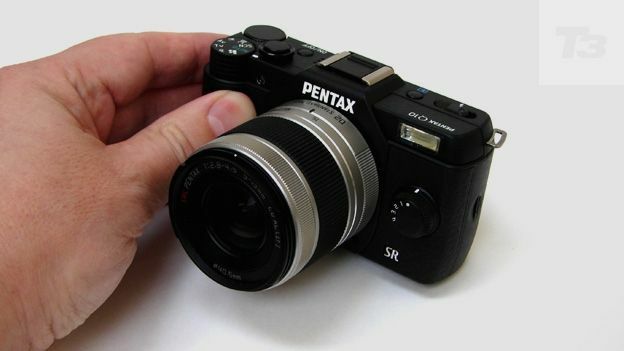 Also in the Pentax Q10's favour is a low-ish price tag. Available in either black, white or red variants, suggested retail cost for body and 5-15mm zoom with reasonably bright/fast maximum f/2.8 aperture is £379.99. While the former is the option we had in to play with, should you want extra zoom power a double lens kit adds a 15-45mm for £539.99 all-in. The design and layout of the Q10 resembles a classic digital SLR that's been miniaturised. While the smaller scale gives it less immediate gravitas and makes it feel a little toy-like despite the solid build. However, there's obvious appeal for anyone trading up from a compact; namely that the Pentax Q10 is probably the least intimidating and therefore most approachable compact system camera available. That said it doesn't totally omit enthusiast-pleasing aspects in return for user friendliness. We still get a vacant hotshoe for accessory flashgun, and program, manual, aperture priority, shutter priority creative settings on the shooting mode dial. Despite its tiny size, said dial has a reassuringly stiff feel and rough edges for easier purchase. It also falls ergonomically under the forefinger by virtue of being located right next to the raised shutter release button and smaller on/off control. Naturally, the dial offers fully automatic stills settings too, while video also gets its own option alongside re-optimised scene modes. Here there are 21 settings to choose from, including a trio of night-time modes alongside the more regular portrait and landscape. Less immediately obvious is the shooting mode marked 'BC' which stands for Blur Control. This is the setting for achieving shallow depth of field effects; blurring foregrounds and backgrounds while keeping a central subject sharp so that it pops out at the viewer more. The Q10's top plate also finds room for a dedicated playback button and a sliding switch for releasing the built-in flash, which pops up in flick-knife fashion. It looks rather vulnerable when fully extended, but does, however, capably distance the flash from the lens to help avoid the red eye effect when taking people portraits with flash. To the right of the LCD at the back we find a range of controls that resemble those on any other compact point-and-shoot, with the exception of useful dedicated buttons for ISO and exposure compensation, as we might expect to find offered on a DSLR. There are also self timer and white balance options as we'd expect to find on any compact. This means that anyone who has used an entry-level DSLR and/or compact camera will find using the Q10 instantly familiar. While the Q10's back plate LCD is fixed rather than angle adjustable, and the camera omits an eye-level viewfinder, it offers a respectable 3-inches in size. Because of the narrowness of its surrounds it somehow seems smaller though, and, while resolution is an adequate 460k dots we struggled to determine whether a shot was properly in focus without enlarging it on screen. Fortunately this can be done with a thumb spin of the command dial located top right of the camera back. Rather than being loaded into the base of the camera's handgrip, as is traditional, the wafer-like D-LI68 battery here is slotted into the left-hand side of the camera while optional SD card (all varieties accepted) is slotted into the right flank, if viewing the camera from the back. The Pentax's cell manages up to 270 images from a full charge, which is OK given the modest asking price for this system camera. It does, however, fall short of the 320 shots offered by better/pricier CSCs, such as the Sony NEX-6, or the whopping 980 pictures offered by the Pentax-5 II DSLR. In common with premium-end compacts, the Q10 offers the ability to switch from the default image aspect ratio of 4:3, common to 99 percent of digital cameras, to 3:2, 16:9 or the less common 1:1, the latter aping a medium format camera. An issue with shooting with any compact camera is that any hand wobble or camera shake can result in softened or blurred images, and, despite the built-in stabilisation on offer here, that's occasionally the case with the Q10. We're more forgiving of the Q10's performance when it comes to video where any slight wobble isn't so critical, and in fairness the 'movie' results we got from the Q10 looked and sounded great. Stills were, however, hit-and-miss when taken with the standard zoom, though the built-in effects can rescue an image and give it the sort of punch and high contrast appearance missing from the occasionally flat-looking pictures retrieved straight from the camera. Overall though, results looked more like snapshots than we'd expect to see if we were using an actual digital SLR or a CSC with a physically larger sensor, such as a Sony NEX, Samsung NX210 or even a Fuji X-Pro1. We've been conditioned to believe smaller is better when it comes to consumer electronics, and the Pentax Q10 is the kind of camera you'd be happy to have on you at all times. But naturally, that convenience and portability doesn't come without caveats. Here the biggest stumbling block is that the Q10's sensor at 1/2.3-inch in size is no larger than that found in the majority of point and shoot compacts some £150 cheaper on average. This was the same criticism levelled at the original 'Q' - the sensor here is no larger - leading its predecessor to be seen as something of a toy. So the same could be said of the Q10, in that results are no match in terms of definition and colour as those of the brand's physically larger (but eccentrically designed) Pentax K-01 CSC. The latter offers an APS-C sized sensor a match for a DSLR proper and thus lovely image quality. So, with untreated images a little soft straight out of the Q10, when equipped with its standard zoom, we can't really recommend it outright as a replacement for that digital SLR. There are many better compact system cameras available too. But in fairness the Q10's lower price tag reflects both these facts. Like the Lomo camera range, the Q10's inherent cute-ness, portability and affordability will win it more friends than its limited performance capabilities.